Without excellent teachers year after year, children who start out behind simply can’t catch up. And students who are on track or ahead can’t leap forward like their peers in the highest achieving nations. On average, students with excellent teachers—those in the top 20 to 25 percent today—make approximately three times (3X) the progress of students with teachers in the bottom 20 to 25 percent. We call these excellent teachers “3X teachers.” They produce well over a year of progress in their students each year, and every student needs them—not just once every four years, but consistently. What difference does consistent access to excellent teachers make? Children who start out one year behind their peers can catch up—if they have an excellent teacher two years in a row. 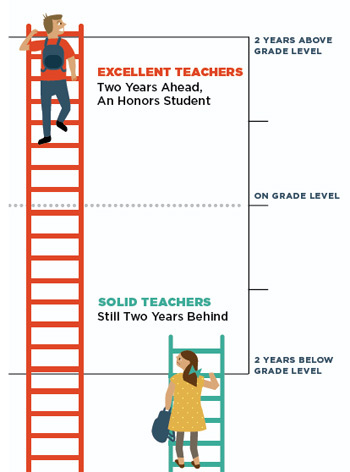 Children who start out two years behind can catch up—if they have an excellent teacher four years in a row. With an excellent teacher eight years in a row, children who start out two years behind can not only catch up—they can be two years above grade level! But without those excellent teachers, students who start out behind will likely stay behind, even with solid teachers who produce a year of progress each year. As we demonstrate in the report Opportunity at the Top, even if our nation’s boldest efforts to recruit more top teachers and remove the least effective teachers succeeded, nearly two-thirds of classrooms still would not have excellent teachers. About 64,000 top teachers leave teaching every year—and the best who stay reach no more students than the very worst teachers. But if we create an Opportunity Culture in our schools—keeping our best teachers, extending their reach to more students, and implementing bold recruiting and dismissal efforts—nearly all of our classes could be taught by gap-closing, bar-raising teachers, in just a half-decade. In those classes, the excellent teachers who produce more than a year’s worth of progress can get lagging students up to speed, and more: Children who start out already at grade level can leap ahead, and children who have the chance to catch up from behind can then leap ahead, too—all looking like their “gifted” peers every year they have an excellent teacher. Meanwhile, empowered excellent teachers can help peers use their strengths in a variety of new team-teaching roles and keep developing their own instructional excellence. Co-teaching on teams where excellence is acknowledged provides authentic on-the-job learning and enables a team’s teaching to rise to the level of the most skilled teachers in each instructional area. Schools may find an Opportunity Culture, with its enhanced career and pay opportunities, especially effective for recruiting and retaining excellent teachers and teams in hard-to-staff schools and positions, such as STEM teaching, that students sorely need. With excellent teachers, we can not only close our gaps—we could move toward being a whole nation of high-achieving students. What do we need to do as a nation to realize this vision? We need to redesign schools so that excellent teachers reach vastly more students. And we need to reform policies to create the opportunity and will to extend the reach of excellent teachers. Share your ideas and feedback on our Feedback page. "With excellent teachers, we can not only close our gaps—we could move toward being a whole nation of high-achieving students."